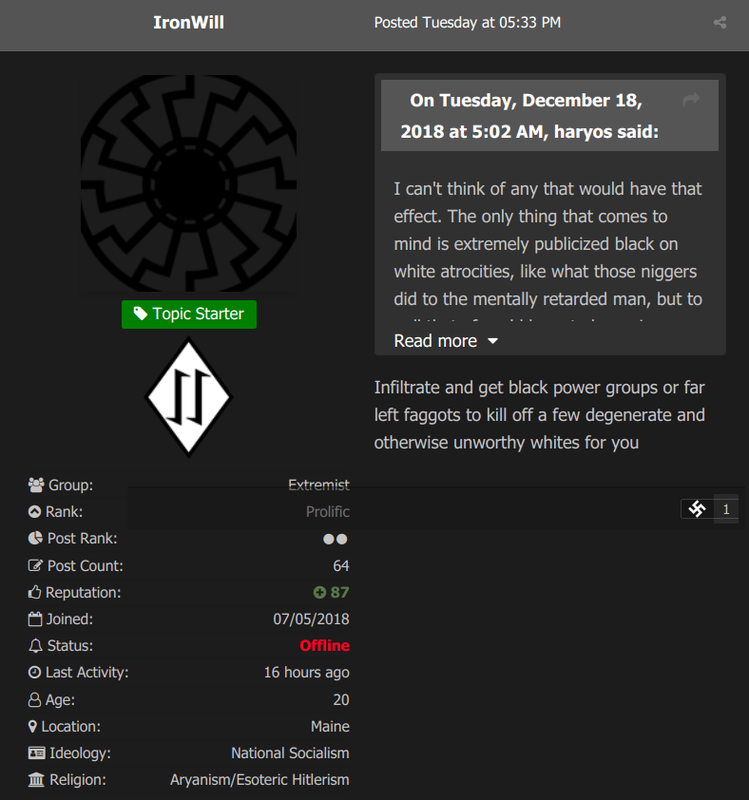 From assassinating celebrities to creating fake social media accounts, neo-Nazis recently considered how to best further their ill-fated cause on a small, but growing terroristic forum. 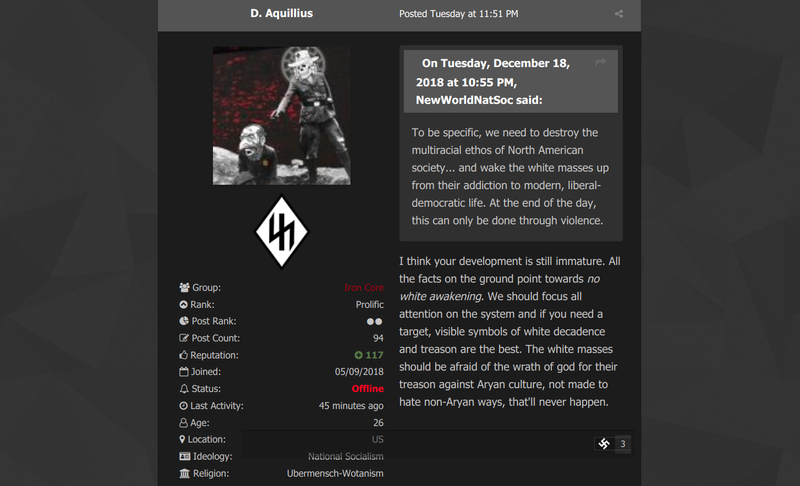 About three months have passed since I first wrote about Fascist Forge, an international neo-Nazi forum “modeled after” the now-defunct Iron March website. Although I planned to write only once about the damned forum, I stumbled upon a lively but also potentially deadly discussion thread about how forum members can best take “direct action” against society. Responses varied greatly. Some members, like Reltih, suggested using “partisan tactics” from the Second World War to “disrupt communication lines” and the electrical grid. 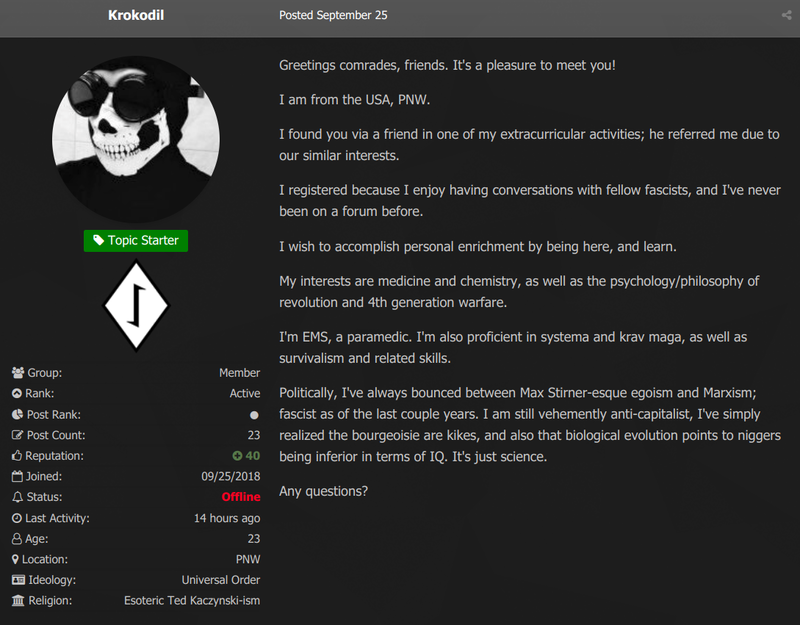 A screenshot of Krokodil’s introduction post on Fascist Forge. Posted September 25. 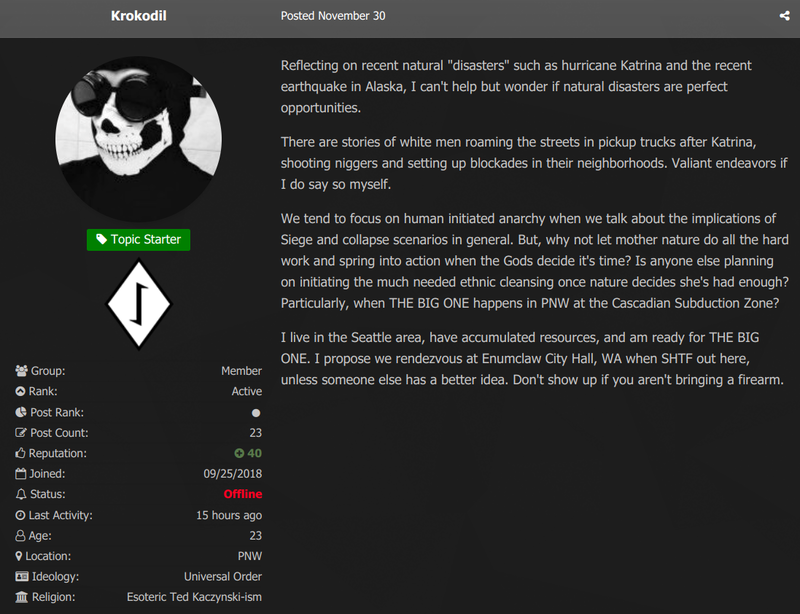 In a separate discussion thread on November 30, Krokodil argued that natural disasters lead to “perfect opportunities” to kill others. “Don’t show up if you aren’t bringing a firearm,” he added. Another user said brainwashing children is a good form of direct action. 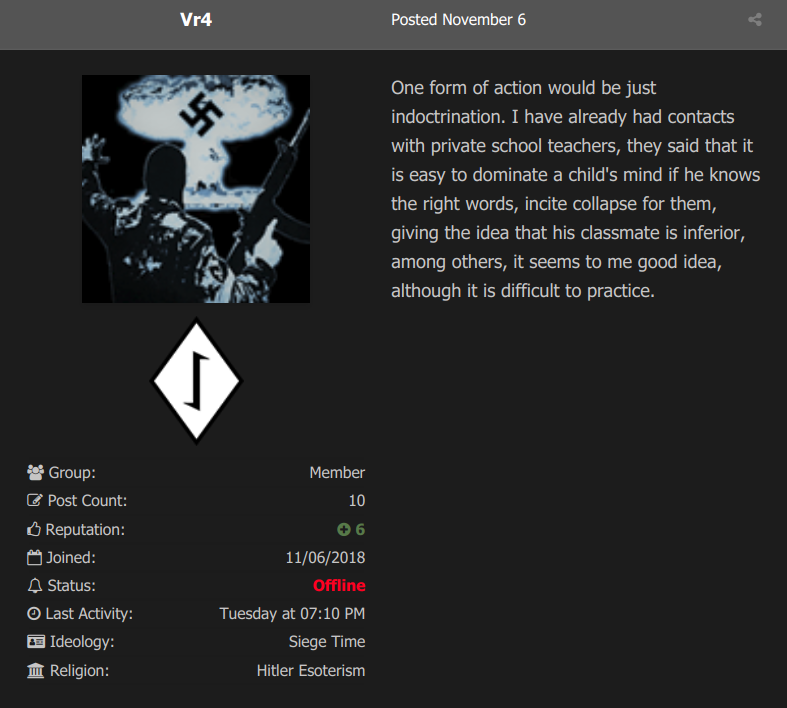 Vr4 — a relatively new member from Brazil — wrote that he has connections to private school teachers. 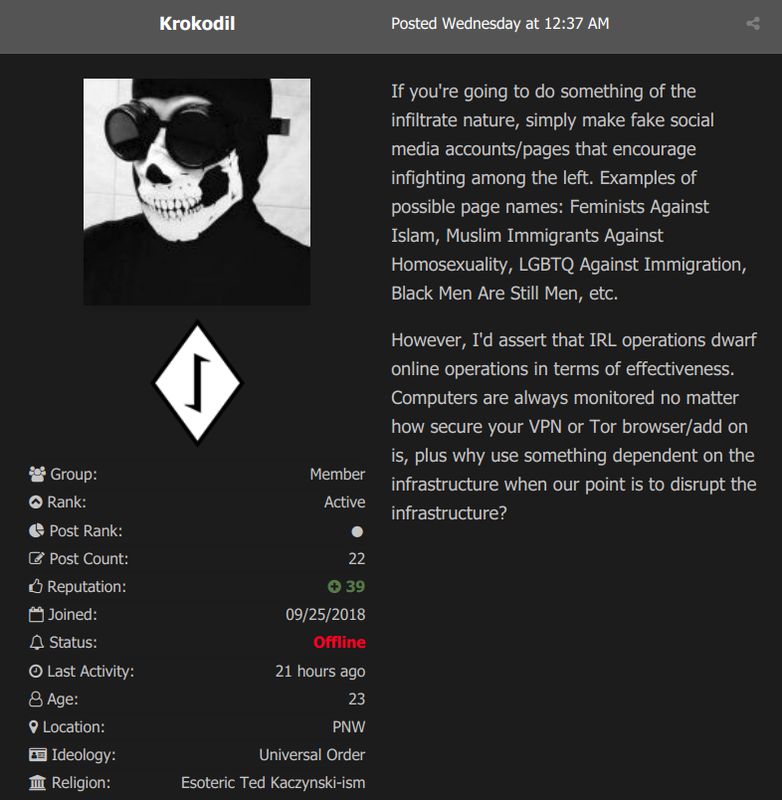 “Either plan the whole thing online and get a bunch of niggers to blow up something or get a few weakling Reddit pseudofascists and groom them to hate themselves enough to blow it up themselves. On targetting Redditors, Haryos disagreed with IronWill, writing that “grooming” them won’t be enough to convince them to take action against “the System.” After all, they will still be a part of the System. “The only way to get them to blow up a federal building is them fully believing in the worldview, not by grooming,” he asserted. Krokodil — who named himself after an opiate analog — wrote that smoking cigarettes “habitually” would push you to attack others. And in case you thought he was joking, he’s not. “You’re going to die anyway,” he reasoned.